1. Create a paper template for the necklace design by tracing around the base of a plastic CD spindle case on paper for the inside neck measurement. Draw the outer edge of the necklace by measuring two inches below the bottom of the circle and tapering the curve up toward each side of the neck. The pattern will resemble a sun visor. Scan the template into the computer and print it out on transparency film. Cut out the paper pattern and trace the outline onto the tapestry fabric with a fine-tip pen (figure A). Use the transparency printout as a see-through pattern to determine which part of the fabric pattern to use. 2. Iron fusible webbing to the back of the tapestry and bond the fabric to buckram (more information on buckram at the end of the tutorial) or another stiff interfacing. Cut around the design, leaving several inches of border. 3. Scan and alter a photo using image software into the size and colors desired for a central "cameo". Print out image onto an inkjet transparency. 4. Transfer the photo to a piece of muslin using polymer medium. Brush the medium onto the muslin, press the transparency in place and burnish well with a bone folder. Lift the transparency off the fabric. Let it dry and seal the transfer onto the fabric with additional polymer medium (figure B). 5. Cut piece into an oval shape. Finger-paint the edges around the photo with raw sienna acrylic paint to create a vintage look (figure C). 6. Pin in place and bead around the muslin cameo with #8 seed beads and glass pearls to cover the raw edges of the muslin (figure D). There is no need to turn under the edges as the polymer medium and paint will prevent the fabric from unraveling. 7. 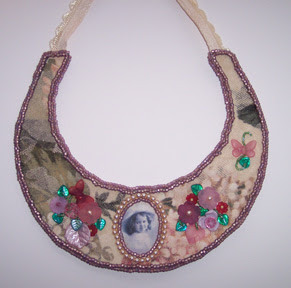 Stitch embellishments to the rest of the necklace; flowers, beads, charms, etc. Use tiny #11 cylindrical beads to create vines and stems (figure E). 8. Backstitch a line of #8 seed beads around the outline of the necklace. 9. Run a very thin bead of fabric glue or acrylic medium just outside of this line of beads. Let it dry and clip the fabric close to the outside of the glue line, without cutting into any of the stitching (figure F). 10. Determine the ribbon length and cut ribbon ends at an angle. Treat the ends with either a liquid seam sealant or fabric glue to prevent unraveling. Glue ribbons to the back of the tapestry (figure G). 11. Use fusible webbing to attach the necklace to a piece of faux leather backing fabric, sandwiching in the ribbon ties. Place the necklace face down on several layers of towels to prevent them from crushing the beading designs, and cover the faux leather with a thin towel to keep from flattening the pile. 12. Clip the backing even with the tapestry (figure H). 13. Stitch another line of beads to cover the raw edges. 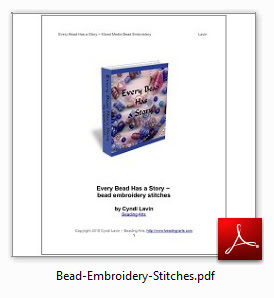 Pick up one bead at a time and bring the thread up through all layers of fabric, exiting behind the first line of beads. Then pass the thread down through the bead that was just added, pick up another bead and repeat the sequence the entire shape of the necklace (figure I). This technique leaves the edge completely finished. Pretty please, send me a link?